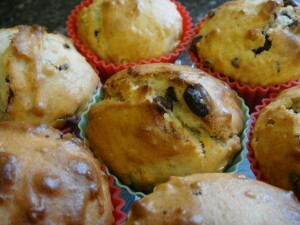 This recipe only takes a few minutes to prepare and makes 12 large size muffins. They are firm and springy in texture and taste delicious. Beat the wet ingredients together in a small bowl. Pour the wet ingredients onto the dry ingredients and mix together thoroughly. Spoon the mixture into 12 muffin cases and bake in the oven gas 4 / 180c for 20 – 25 minutes, until golden in colour. Test in the middle with a cake tester or sharp knife, which should come out clean.